What is Aesthetic Pro Online? Aesthetic Pro Online is a cloud-based, HIPAA compliant medical spa platform designed for medical aesthetic practices, medical spas, LHR centers, wellness centers, weight loss clinics, and tattoo removal. The software comes with a robust set of features which include: a marketing suite, calendar suite, POS software, Erecords, client portal, and client & lead management. 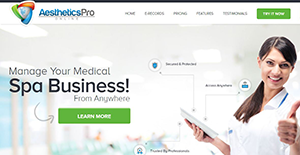 Aesthetic Pro Online provides a secure and flexible platform that integrates unique EMR capabilities with reliable web-based hardware compatibility to empower on-the-go utilization. Whether you are managing one or a hundred locations, this system uses cutting edge technology which allows you to see the performance in real time and make informed decisions. Aesthetic Pro Online is a user-friendly, secure, and safe system with a lot of industry-unique features to offer. One such feature is the staff management feature. This feature helps you to manage your employee’s payroll, timesheet, commission and even tips. Besides, the functionality comes with an effective staff calendar, which enables you to manage staff scheduling and eliminate overbooking. Another stand out is the fully integrated marketing suite. The suite helps you to easily contact your clients without the need for an additional module or software. Besides, the marketing suite comes with a built-in email marketing functionality. This functionality enables you to stay in touch with your clients by sending custom actioned emails. It also helps you to generate more leads by sending email blasts (smartly automated eblasts), creating schedule points and initiating drip campaigns. In addition, the marketing suite provides vital tools that help you to track your email marketing campaigns. What’s more, Aesthetic Pro Online has a reliable Erecords features which help you to store all information in secure, HIPAA compliant formats. The software has a robust form library which enables you to manage all clients’ data (whether its treatment form or intake forms) efficiently and quickly. Besides, the system provides professionally developed forms and editing tools which ensure you have the form you need at any time. If you are considering Aesthetic Pro Online it might also be a good idea to examine other subcategories of Best Medical Practice Management Software collected in our base of SaaS software reviews. It is crucial to keep in mind that virtually no app in the Medical Practice Management Software category is going to be an ideal solution that can fulfill all the requirements of various business types, sizes and industries. It may be a good idea to read a few Aesthetic Pro Online reviews first as certain services can perform well only in a very small set of applications or be prepared with a very specific type of industry in mind. Others can work with a goal of being simple and intuitive and consequently lack complicated features desired by more experienced users. You can also come across software that cater to a wide group of customers and provide a complex feature toolbox, but this in most cases comes at a more significant price of such a service. Make sure you're aware of your needs so that you purchase a solution that has specifically the elements you look for. How Much Does Aesthetic Pro Online Cost? We realize that when you make a decision to buy Medical Practice Management Software it’s important not only to see how experts evaluate it in their reviews, but also to find out if the real people and companies that buy it are actually satisfied with the product. That’s why we’ve created our behavior-based Customer Satisfaction Algorithm™ that gathers customer reviews, comments and Aesthetic Pro Online reviews across a wide range of social media sites. The data is then presented in an easy to digest form showing how many people had positive and negative experience with Aesthetic Pro Online. With that information at hand you should be equipped to make an informed buying decision that you won’t regret. What are Aesthetic Pro Online pricing details? What integrations are available for Aesthetic Pro Online? If you need more information about Aesthetic Pro Online or you simply have a question let us know what you need and we’ll forward your request directly to the vendor.